The steamship RMS Titanic sank in the early hours of April 15, 1912, in the North Atlantic after striking an iceberg during its maiden voyage. Of the 2,240 people on board, more than 1,500 lost their lives in the disaster. In the wee small hours of April 15, 1912, 106 years ago today, the mighty RMS TITANIC, pride of the White Star Line and one of a class of luxury ocean liners that were the biggest on the sea at their time, slipped beneath the waters of the frigid North Atlantic after hitting an iceberg. Previously billed as “unsinkable,” the TITANIC’s hull was divided into multiple watertight compartments… but they only went partway up. She was designed to survive the breaching of four of those compartments. 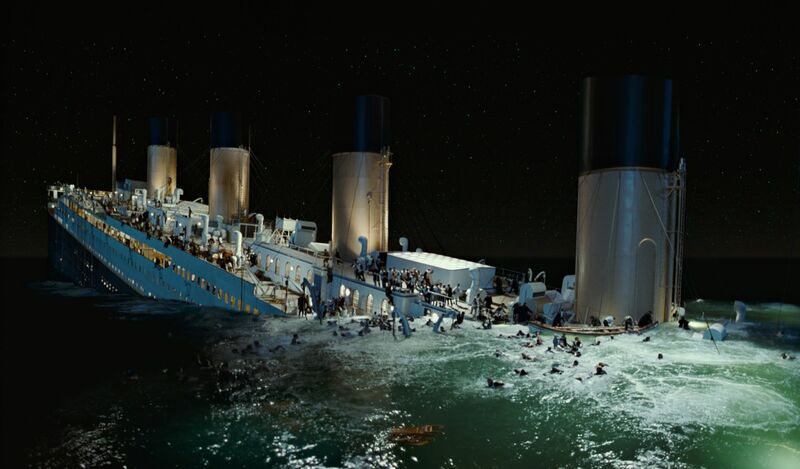 Unfortunately, when she sideswiped an iceberg, late on the night of April 14th, five compartments were breached. The cascading effect of water pouring over the top of the breached compartments and into the next dragged the bow down and made her eventual sinking an inevitability. Over two-thirds of her passengers and crew went down with the ship, drowned, or died of exposure in the ice-cold water. The loss of the TITANIC is still one of the greatest peacetime maritime disasters in history. 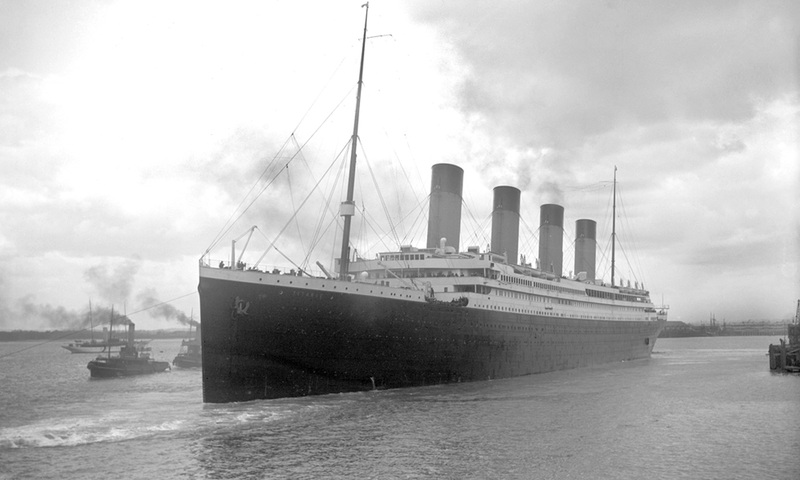 Equipped with a powerful Marconi wireless set, TITANIC was in touch with many – including her sister-ship, the RMS OLYMPIC, racing to the site but too far away to arrive in time. 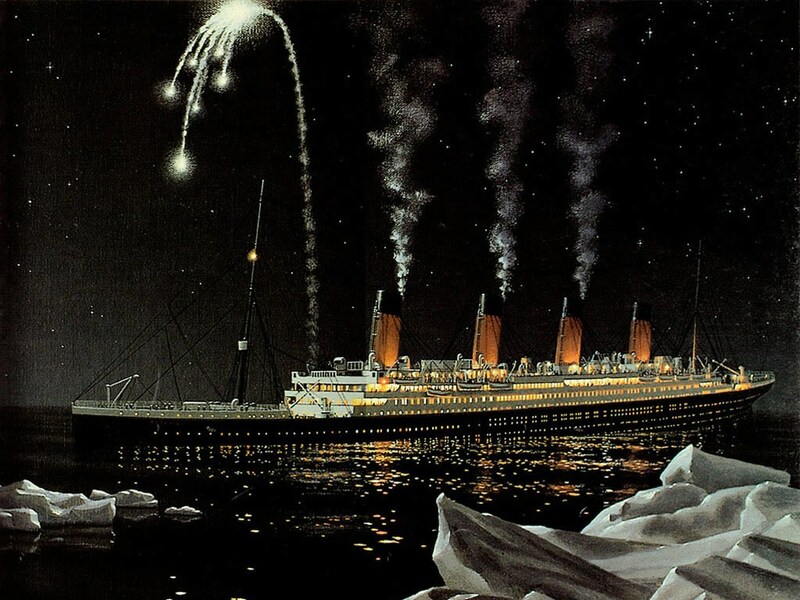 Indeed, the only vessel near enough to have effected a rescue before TITANIC went down, the SS CALIFORNIAN, had shut down her Marconi station after a brief exchange with TITANIC and thereafter ignored her – even when, in her last desperation, she began firing distress rockets. Incidentally, the actions of CALIFORNIAN’s captain, Stanley Lord, were later found by both American and British courts of inquiry to have been unprofessional and negligent, and while formal charges were never filed, his career was – understandably! – over. TITANIC fires distress rockets as she settles low into the water. Yet even with CARPATHIA’s almost superhuman efforts, they arrived as dawn was breaking, an hour after the TITANIC had sunk. It was well that they got there when they did, though, as the survivors – dressed for ballroom dancing, or for bedtime, not for surviving in freezing temperatures – would surely have begun succumbing to hypothermia had they been forced to remain in the lifeboats (tragically few in number, and even if they had all been launched, at maximum capacity, insufficient for the number of passengers and crew) for very much longer. Though there were many technical issues that contributed to the disaster – brittle steel in the hull-plates, the aforementioned “watertight” compartments that didn’t go all the way up to the main deck, insufficient lookouts with insufficient binoculars, and an inexperienced officer-of-the-deck on duty, at night, in iceberg-infested waters – TITANIC and those aboard her ultimately fell victim to the hubris of the age. Her loss was the beginning of the end of many things.